With Rahul Mahajan testing negative for any drugs and BB Moitra’s post mortem indicating death by poisoning, the mystery surrounding Friday’s tragic incident has further deepened. 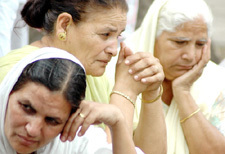 The Punjab Congress has urged the government to provide relief to terror-affected persons in Punjab on the pattern of relief announced by the Centre for victims of the anti-Sikh violence of 1984. While it is almost certain that the Sabeer Bhatia-promoted Nano City will be set up in Panchkula district, the possibility of this project taking shape in the Morni hills is remote. According to sources, a site has been selected between the Tangri and Dangri rivulets in Raipur Rani block of Panchkula. Unaccounted-for-cash, or the black money, can be kept safely in a bank. To be precise, this money can be safely stashed away in a bank locker, or the new age storage having vaults. And it is not only cash, but even bullets and plastic explosives (RDX), drugs, or unaccounted for gold, are also being stored in bank lockers and vaults. Although the situation is not alarming, but the state government has requested the Centre to ask the Chinese authorities to remove the existing blockade on the Parechu river so that there is easy flow of water. This was stated by the Chief Minister, Mr Virbhadra Singh, while speaking at a state-level programme of the Disaster Management Committee here today. Mr S. S. Kandhari, here today. Arrivals and departures at Mumbai airport have been affected for the past three days after a heavy downpour damaged the radar system, according to information available from the Airports Authority of India. Sources confirmed that the downpour affected the localiser installed on the main runway of the airport. The Police here today claimed to have picked up local suspects with background of being involved in militant activities and grenade throwing incidents. This, according to an official spokesman quoting I G Police, Kashmir, S M Sahai, had been done to apprehend culprits behind the attacks on tourist buses in the valley. Indians are being exposed to dangerous levels of highly toxic gases, including carcinogenic organic compounds and sulphur fumes, everyday through the air they breathe even as the country continues to have “no standards for these chemicals found in ambient air”.